Little pearl onions aka shallots have an intense flavor and give curries an immense flavor, be it vegetarian or meat based. I use them a lot in my regular cooking and today’s vegan recipe has shallots as the star ingredient. You cannot make this recipe with the regular white or yellow onions. The combination of tamarind, spices and jaggery meld with the shallots to yield an amalgam of flavors that are addictive making you want to eat more and more. Seriously. Eat it with rice, brown rice, roti or dosa, you will love it. 1 Heat oil in a heavy bottomed vessel, add the mustard seeds and let them jump around. Add the cumin seeds, fenugreek seeds, red chili and fry for few secs till they turn brown. Donâ€™t burn them. Lastly add curry leaves, followed by the shallots. 2 Saute the shallots for 5-6 mts. Add ginger garlic paste and saute for another 4-5 mts. Add red chili powder, coriander pwd, cumin pwd and roasted methi pwd. Mix. 3Add the tamarind extract along with 1 1/2 cups of water, salt and jaggery and bring to a boil. 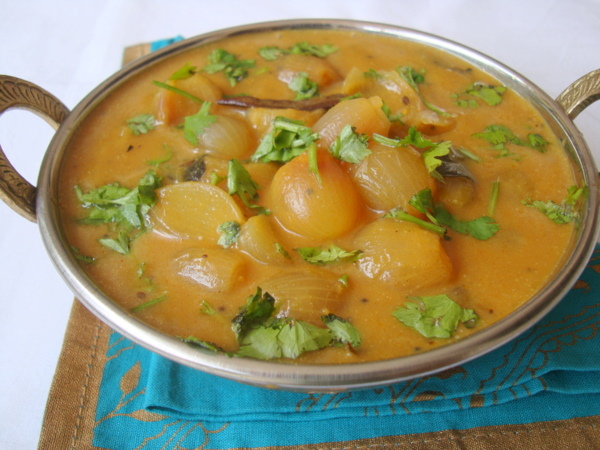 Reduce heat and let it simmer for 10-12 mts, till the rawness of the tamarind disappears. 4 Towards the end of the cooking process, add the besan water and mix. Cook for 2 mts and turn off heat. 5 Add half of the fresh coriander and keep covered for a few minutes before serving. 6 Remove onto a serving bowl. Garnish with the remaining fresh coriander and serve with hot steamed rice, vadiyaalu and appadam (papad). Like the South Kerala Theeyal..looks delicious! one doubt. we are adding some methi seeds in tadka. Why are we adding pinch if methi powder also? You are adding 6-7 methi seeds which yields a very mild flavor and the roasted flavor of methi seeds powder alleviates the flavor profile of the pulusu. Highly inviting shallot stew, drooling here..
Hi, this looks delicious. I’m in the US and trying to follow the ingredients, what is jaggery? Jaggery is basically an unrefined sugar prepared with sugar cane juice and the molasses are not separated. Its rich in iron and is golden yellow to golden brown color. It goes by the name jaggery and gur (hindi). You will find it in Asian and Indian stores. If you cannot find jaggery, use brown or white sugar. Hope this helps. i’m very glad to tell you that i tried the recipe and it turned out very yummy. This is Almost similar to Sindhi Kadhi with plus minus a few ingredients.. The recipe looks good. One small thing though. Pearl onions are not shallots. Pearl onions belong to the leek family.